Firefighters remain on 'high alert' as five days of fires finally end. Firefighters have extinguished blazes that ravaged Israel over the past five days and caused close to 100,000 Israelis to flee their homes, authorities said Sunday, blaming arsonists for a large portion of the outbreaks. There were no deaths but 122 people were treated for injuries, mainly smoke inhalation, medical officials said. ripped through thousands of acres. 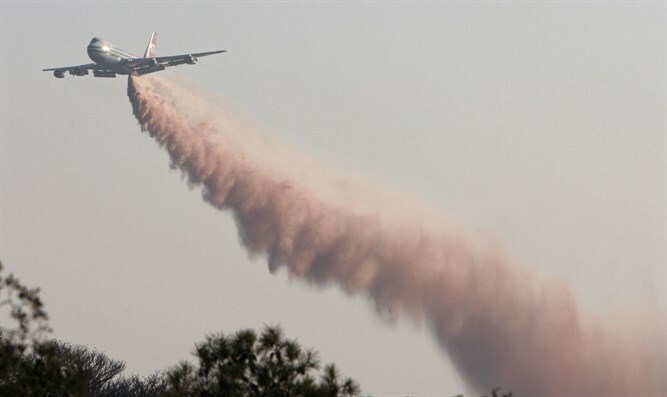 Firefighting planes from a list of countries, including supertankers from the US and Russia, flew low over Israel, dropping tons of water and fire retardants. At one point last week, flames towered over an area near Jerusalem, and residents on Sunday surveyed charred homes and businesses. "There are no active sites left," fire and rescue service spokesman Yoram Levy told AFP. "Since last night (Saturday) it's pretty calm. We have no new activity." Levy said firefighters dealt with about 2,000 fires across Israel, 20 of them major. He noted forces were still "on high alert" because of dry conditions and high winds not expected to change before rain expected on Wednesday. Kiryat Malakhi in southern Israel. Israeli authorities suspect some of the worst blazes were set deliberately Arab arsonists looking to kill civilians. Defense Minister Avigdor Lieberman (Yisrael Beytenu) said Sunday that 17 of 110 fires in Judea and Samaria were so far determined to have been arson, without elaborating. Police have arrested 37 people suspected of setting fires and interrogated others.